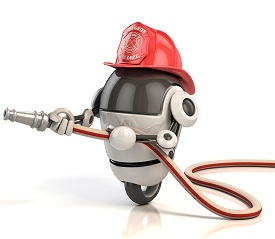 Home › Cyber; IoT and Technology › Are “Sound Waves” the Future for Fighting Fires? Are “Sound Waves” the Future for Fighting Fires? For their senior research project, two young engineering students at George Mason University came across an experiment conducted by the Defense Advanced Research Projects Agency (“DARPA”) in 2012 called “acoustic suppression of flame.” In a nutshell, the experiment focused on whether sound waves could disrupt flames. The research was ultimately abandoned after the agency was unable to effectively analyze whether the use of sounds waves could disrupt flames on a large scale. After reviewing the research, the two engineers became interested in whether something portable and affordable could be created that would generate sound waves to suppress flames. Their original concept was a hand-held device that would extinguish kitchen fires and perhaps fires in small, confined spaces. If they could develop such a device, an obvious benefit would be the elimination of toxic and messy chemicals commonly found in commercial fire extinguishers. After much skepticism was expressed regarding their proposal, the two students began controlled experiments to determine whether the idea was commercially viable. The engineers first placed flaming rubbing alcohol next to a large subwoofer. This approach was unsuccessful so they then tried ultra-high frequencies which made the flames vibrate but not go out. They finally used very low frequencies in the 30 to 60 hertz range and noticed that fires began to extinguish. After replicating this scenario many times, the engineers discovered that the sounds would “vibrate” the oxygen away from the flames. Once the small fires no longer had oxygen to keep them going, the fire would suffocate and die. A prototype “sound extinguisher” was then created. It is basically a large can that is connected to a ventilated amp. A bass speaker installed inside the can emits sound which is then directed into a tube with a hole at the end which narrows the sound waves to a small area. The end of the tube and accompanying low frequency bass is what is projected at the flames. While the students have had success with extinguishing small alcohol-fueled fires, they are optimistic that it can work for other flammable chemicals as well. A local fire department has requested further testing of the sound extinguisher on structure fires, and the students are applying for a provisional patent. While this technology is still in its infancy, it at least provides the prospect of yet another alternative to effectively fight fires.